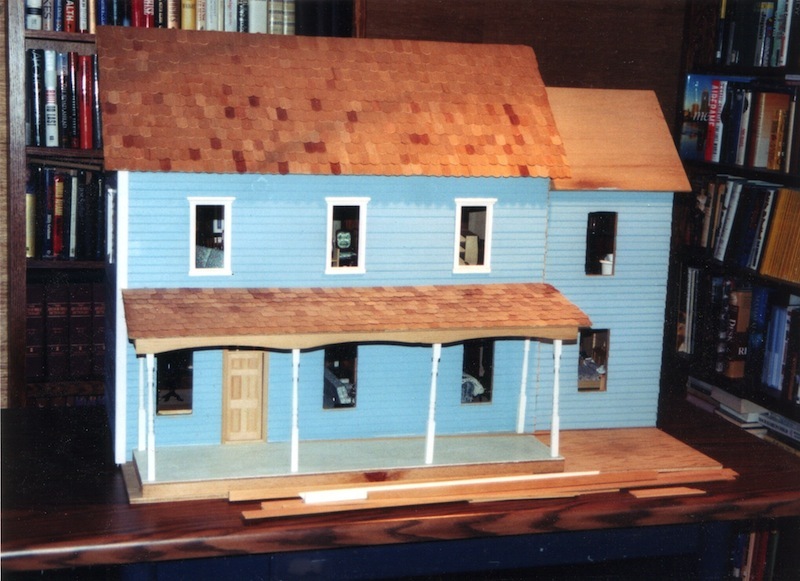 About ten years ago, my mother-in-law gave me a dollhouse that she had won in an auction. I loved the house, but I was too intimidated to do anything with it. I decided to collect smaller dollhouses and work on those first so that I would not ruin this house. A few years later, I came across another house exactly like this one (except for the side extension) and this one became Mr Crumble's bakery. I found out that this particular house is called the Brookshire and was made by the Walmer company. For my original Brookshire, I decided that I would make it into a front opening dollhouse (just like I did to Mr Crumble's bakery). It seems that I tend to destroy all my houses and then rebuild them!!!! I am sure my mother-in-law would be horrified if she saw what I did to the house she bought for me. After it was all said and done I realized that it looked lopsided. I took it back to garage to undergo another "bashing" to add another side wing for balance. For a long time the big old Brookshire has lived in the schoolroom. It became just another shelf to catch all the overflow books and other school stuff. 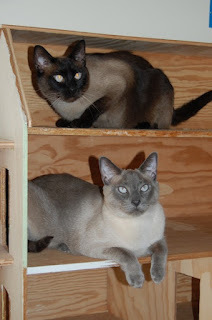 It was also a perfect place for the cats to hang out and watch the kids do school projects. About a year ago, I decided that the time had come to finish this house. I undercoated it, but having no inspiration, just put it back into the schoolroom where it has remained a catch-all shelf. The schoolroom has undergone a series of changes and now the big Brookshire has been given the boot. It has moved into the entryway, and even though it has become a great sleeping place for the cats, it is time to turn it into a dollhouse. (The actual front of the house has been stored in my closet forever!!!). I fear the feline members of your household won't agree with your plans... *LOL* You're very tough, I admire your courage to rebuild your houses this way... and even more the results you achieve. Thanks Birgit. Yes, the cats really like the empty dollhouses. They are going to be upset when I put the roof and front panel back on this house! Thanks. I hope it will be amazing. Sometimes I really wonder when I start to take the houses apart if I will ever finish them. The cats will miss this house when it is done. the kitties look so peaceful curled up asleep in the dollhouses. You are incredibly talented to bash them this way, I admire what you have done with them, and look forward to what you do with this one! Thanks for your confidence Lisa. I never know what is going to happen when I begin to change the houses. I am just as curious as everyone else to see where it goes! You go for it Sam! Bash away and create a beauty worthy of your MIL's approval. :) Cats will sleep anywhere, so pay no mind to them. I'm sure you will astound us all with the result. Thanks Xanadu. It is really scary to alter a dollhouse, especially one that is almost done, but at the same time, it is fun to see a new house emerge from the ruins!